These attachments are used to cut drains in virgin bog which is to be developed for either sod peat, milled peat or peat moss production. 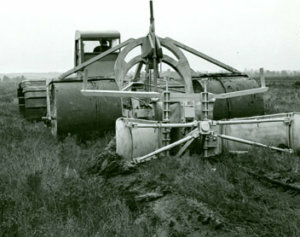 The attachment consists of a plough unit mounted on the end of a long tow-bar; this assembly is straddled by a bridge frame, on the legs of which are fitted two rollers of generous dimensions. Attached to the ends of the plough shares are adjustable wings to displace the spoil clear of the drain cut. The purpose of the bridge frame and rollers is primarily to facilitate lifting the plough unit for idle travel but while working it stabilises the plough transversely while still permitting movement in the vertical plane. The depth of cut is governed by the level of the tow-bar which is adjustable, giving a maximum depth of cut of 2′ 0″ or 3′ 0″ depending on the size of plough.